I don’t often talk about my family or my private life on my blog, as you know. But, this weekend marked a very special occasion for me and one I feel I wanted to mark here, it was my daughter Orla’s 11th birthday. Those of you whom I know in real life, know that my girl is the centre of mine and Luke’s universe. She is literally, the beat of my heart. Eleven years have gone by at the speed of light. I never thought you see I would have children, and never intended to. But, at the age of 42 I had what can only be described as an ‘epiphany’, and I made the decision to have a baby. It was the start of the best adventure of my life. So, with no further ado, here is how we celebrated Orla’s birthday. Our lovely friend Jim Ranson, he of ‘The Great Pottery Throwdown’ fame, hosted a pottery party for her. He was an absolute star, and I can’t thank him enough. Easy going, charming, roguish and funny, he is great with kids. Orla and her friends had a fabulous time. They did some Raku, which was fascinating and exciting. It’s truly magical seeing how those pots come out of the kiln, then into sawdust and water, all black and shiny, then glowing and burnished from the copper oxides. They also made pinch pots, slab pots and did some throwing. Jim managed to pack an awful lot into two hours. A great way for Orla to spend her birthday, being both creative and educational. They all learned a lot about the alchemical process of Raku and how clay is formed. A really fun time topped off with cake and Pizza. A very special day for me and my girl. This is fantastic! I worked for Hornsea Pottery and then Park Rose Pottery and loved to see the pots cast, fired and decorated (by my Dad!). I still marvel at the old designs I see in charity shops. I hope Orla had a wonderful time. She had an amazing time, they all did. Jim was brilliant. I am doing a Ceramics course at the moment, and absolutely love it. It’s my next big love next to drawing. 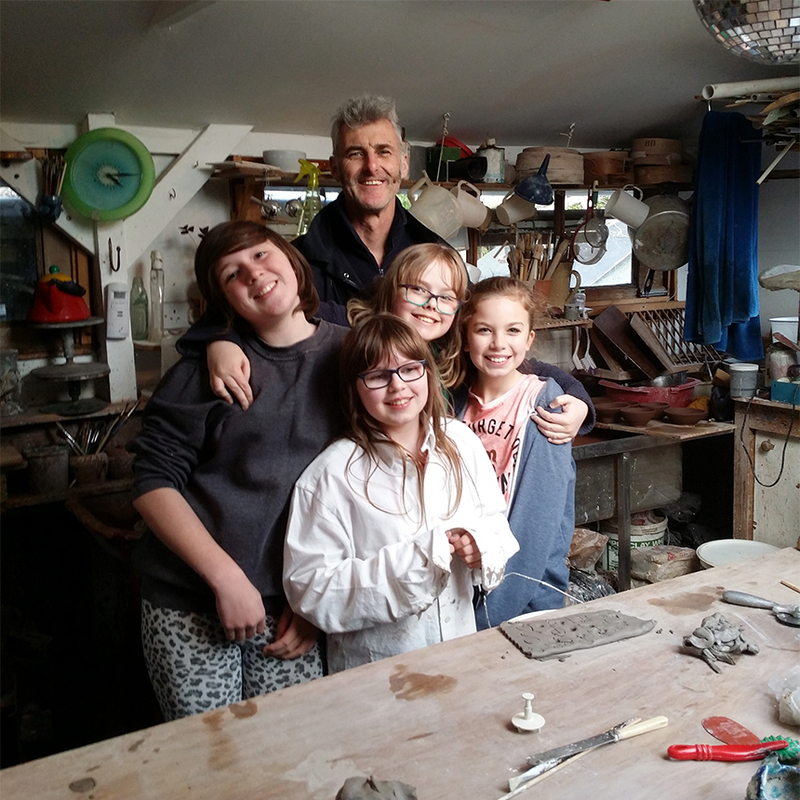 Orla and the girls are now looking forward to see what their pots look like when fired. I didn’t know btw, that your Dad worked in pottery, that’s brilliant. What a great birthday party! It looks like everyone had fun (I know I would have). Time flies… A belated Happy Birthday to Orla! I am so sorry I didn’t reply to this at the time. For some reason the comment ended up in my spam folder, I have no idea why. Many thanks for the kind words, have since passed it on. Orla says, ‘thank you ‘.